JOHANNESBURG Striking miners killed one man by setting him on fire Thursday while another was shot and seriously wounded in rekindled labor unrest in South Africa that saw police firing tear gas and rubber bullets. 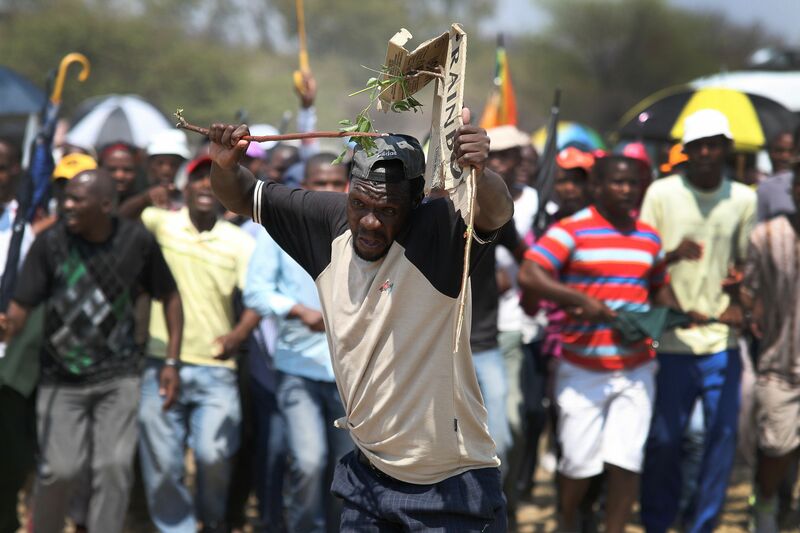 The violence near an Anglo American Platinum (Amplats) mine has escalated since the company dismissed 12,000 striking miners on Friday. North West police spokesman Brig. Thulani Ngubane said at least one person "is fighting for his life" in the hospital after being shot. It was unclear if the victim was a miner or whether the bullet had been fired by police. Another person died of his wounds after being set alight by striking workers, Ngubane said. "The situation remains tense," Ngubane said. Gaddafi Mdoda, one of the leaders of the striking Amplats mineworkers, described the confrontation Thursday morning between police and some of the fired miners as brief. The mineworkers have vowed to make the mines ungovernable and to make it impossible for the world's top platinum producer to hire new workers if their wage demands are not met. Evans Ramokga, another strike leader, said last week that the company would hire new workers only "over our dead bodies." Police apparently were responding to the miners' attempt to stop operations at Amplats' Bathopele mine on Thursday, according to the South African Press Association, which reported that two taxis were set on fire. Amplats' operations in the Rustenburg platinum belt northwest of Johannesburg have been brought to standstill since most of its workers went on strike last month. Amplats calls the strike illegal. South Africa has been under the grip of labor unrest since August, when platinum miners in Marikana staged a wildcat strike demanding higher pay. In a violent confrontation not seen since the end of apartheid in 1994, police shot and killed 34 striking miners and wounded scores more. Analysts say the Marikana strike, which ended with a hefty pay raise for the striking workers, inspired a wave of copy-cat strikes that have since spread to gold and iron ore mines as well as the trucking industry. Most of the strikes remain unresolved.